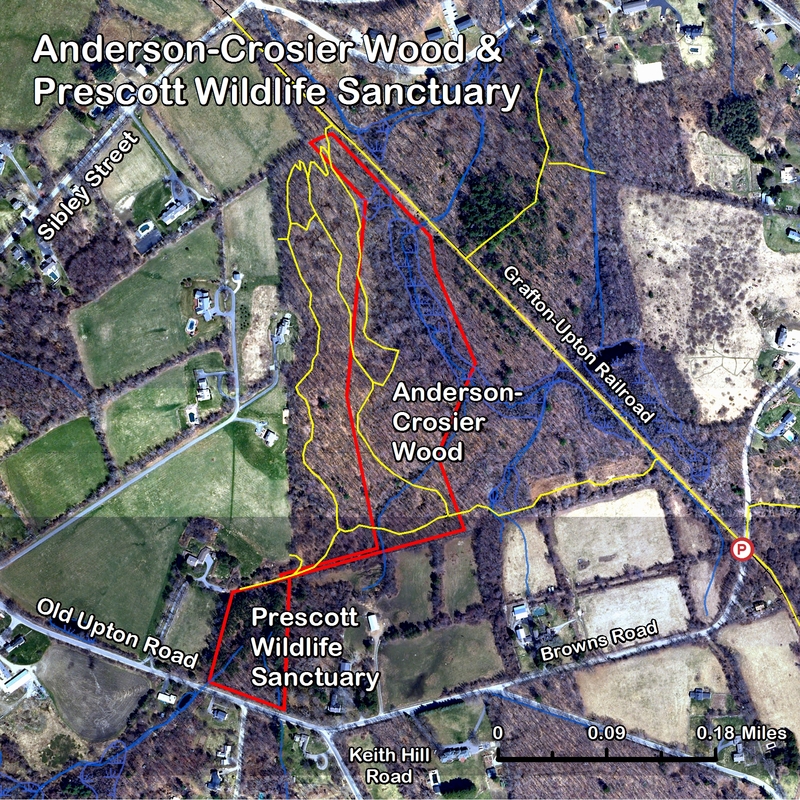 This 3.5 acres of woodlands and wetlands can be accessed from Old Upton Road and has a trail that winds from the white gate along Old Upton Road around the the left over an intermittant stream, and then arcs right to the north side of property, where it enters the Anderson-Crosier Woods. 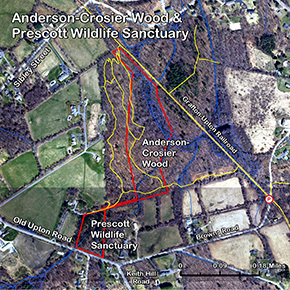 The Prescott Preserve was donated to the Grafton Land Trust in 1967/8 by John and Lenis Prescott. It was the Trust's fourth property. This parcel had been in the Prescott family since 1906 when they purchased it as part of a farm from John W. Beatty. The farm was known at that time as the Bearfoot Farm and earlier as the William Fiske Place. When one of the barns on the adjacent property to the east was being scraped for repainting a few years ago, the inscription "Bearfoot Farm" in large black letters was discovered above the front doors. Painting of that area was stopped and the inscription is currently visible fron Old Upton Road. When donated to the GLT, it had two structures - a garage and a childrens' play house. The garage was torn down and removed shortly after the GLT acquisition. The play house was refered to variously as a Gnome House, an Elf House, and a Fairy House. It was later moved to the backyard of a family on Keith Hill Road, where it was restored at least once It eventually decayed and was disposed of. No pictures of it are known to exist.